The dish above I refer too was cheap, quick and nasty. However, as mentioned, in contrast to my hairline- my tastes have advanced somewhat and the idea of a heavy plate of Mexican food full of cheese, beans and chips is not so tempting. Mejico was the perfect foil for this more refined taste of mine, offering not only great atmosphere and service, but lovely fresh food in a variety of ways. Obviously my first forays into Mexican food were, well, limited. Nachos, as above, tacos stuffed with enough beef to make the challenge of eating them even harder, and then burritos, which seemed to be the same thing, just in a wrap. And this certainly formed my opinion on the spicy nation’s cuisine– it’s all the same, just packaged in a different shell, isn’t it? That’s what I thought anyway. 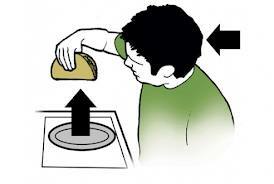 Not only that, but they seemed to be missing such a vital piece of the puzzle- eating tacos is a pain in the arse! How could that idea prosper, firstly, and second- why would it spread the globe as the symbol of Mexican food? You have to turn your head sideways then proceed to scoff it as fast as you can in order to prevent it going everywhere. Anyway, I digress. The reason I’m leading you down that road is because modern dining and the Western restaurant industry’s desire to constantly create ‘the inn thing’ when it comes to culinary trends, means Mexican food is now awesome. No longer is it just heavy plates of beans, mince or chicken with cheese and corn chips. Mejico show cased this perfectly last week with wonderful fresh cerviches, salsas, soft shell tacos and more sizable mains. 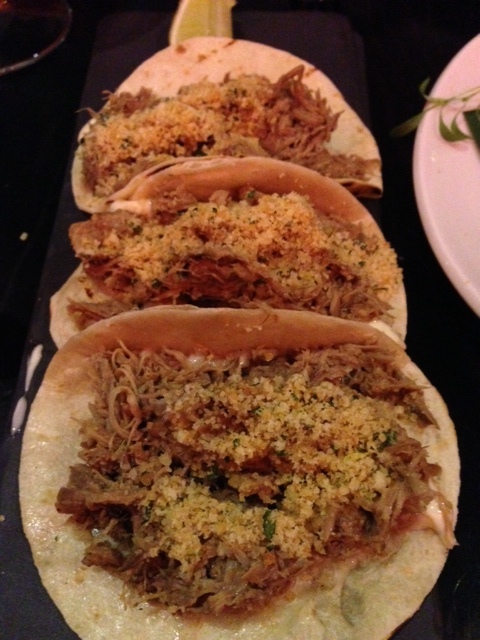 The soft shell tacos were a welcome change to the sidways beef counterparts from my childhood. 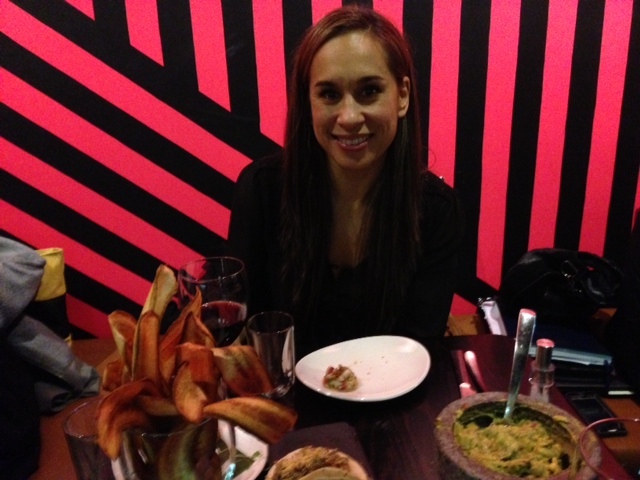 The options of braised lamb shoulder, smoked pork belly or grilled ocean trout proved that. 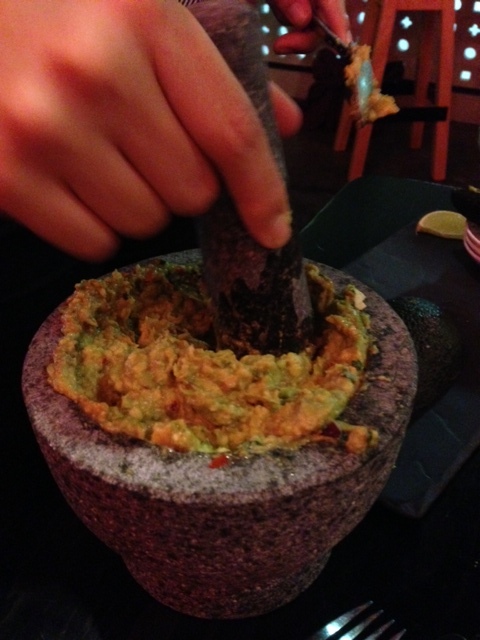 The guacamole was made fresh at the table in front of us in a pestle & mortar and served with crisp plantain chips. 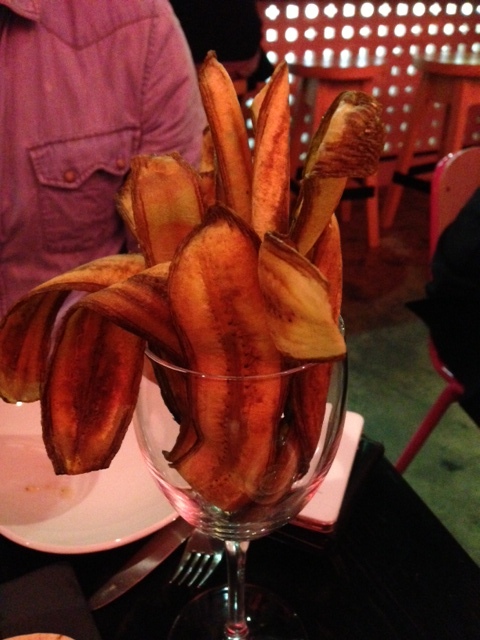 These literally being sliced plantain, fried to crisp. I’m not saying that they are the only place that serves produce harvested that day, but to state it ensures the patron knows they’re getting the freshest ingredients possible. And it showed. The guacamole was flavour packed, the ceviche and lamb tacos were delightful and the main of Achiote chicken was a great end to the fresh start. If there’s one thing that more eateries could afford to do is source quality and fresh produce, like Mejico, and be proud of it. The more places that pride themselves on quality ingredients and start advertising it, the better we all will be for our dining and eating experiences. Bel Biv Devoe playing in the background. Big Check. Like MC, my past experience with Mexican food has too been built around dodgy nachos, burritos and Doritos with Mexican flavoured salsa. I know that these are not representative of authentic Mexican, but the cheesy/beany dishes have been too engrained into Modern Mexican dishes on this side of the world to think otherwise. That is until we went to Mejico. From the beautiful large dried chillies hanging in their kitchen, to the pink and black wallpaper this place screams funky, fresh and exciting. As MC mentioned the quality of the ingredients were of a high standard and much care has gone into highlighting this element in all their dishes. 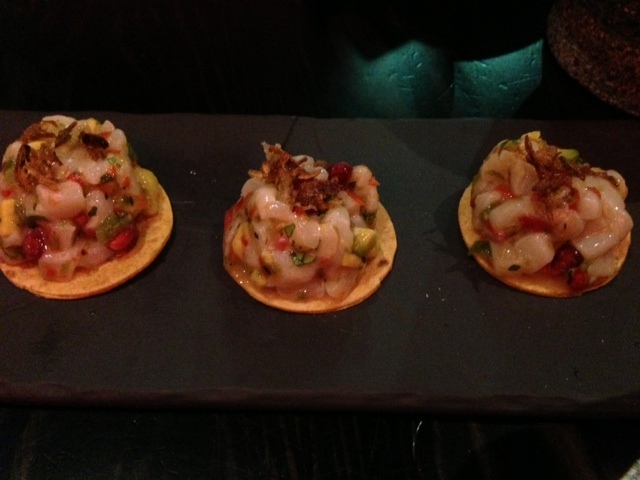 Mejico have created dishes that pay homage to their origin whilst being modernised and slightly Australianised. 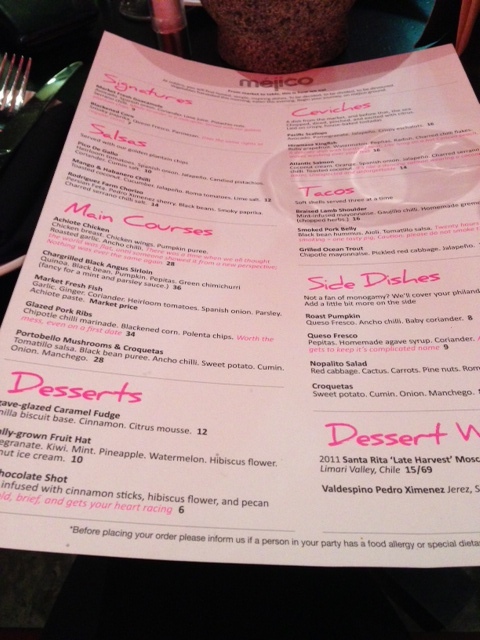 The menu contains many exciting variations on the classic dishes such as the above mentioned tacos and guacamole, and it also has an extensive cocktail, mocktail and tequila list, for those wanting a more serious night. We went to town at this restaurant, and my belly loved every minute of it. So much that at the end of the dinner, I had realised that I hadn’t even thought about what I was going to write in today’s blog. The food was just so enjoyable, and I was just happy to be there eating it. If I was going to use a sporting analogy, I would say that I was in the zone, the eating zone that is (also not to be confused with The Danger Zone from Topman – that’s a different zone altogether). It was just a joyful evening. And the lesson in that? Take time to slow down, be present and fully embrace the whole experience. It can be quite good.